Nobody Migrates Without a Reason! 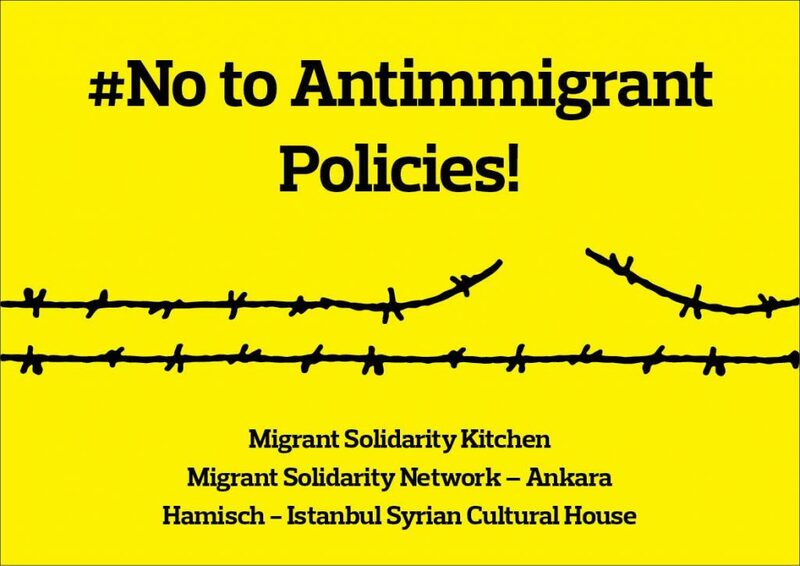 Zero Tolerance for Anti-Immigrant Policies! Since the announcement of early elections on 18th of April, electoral campaigns have brought together thousands of people in different cities and squares across the country. One of the frequently-heard campaign promises during these meetings and rallies has been the promise to send migrants back home, which is the reason why we have decided to make this statement and launch this campaign. On Friday afternoon 25 May 2018, intense fighting broke out at Moria camp, leaving many people injured. A group of around 70 refugees, including many families with young children and several injured people, fled the violence and found refuge in a park in Mytilini. Some injured people were transferred to the hospital by ambulance. The police did not allow the group to stay in the park out of fear for racist attacks. The refugees refused to return to Moria camp stating they feared for their lives. The police insisted for the team of Pikpa to host the people in Pikpa camp that night and guaranteed that the next day the families will be transferred to Kara Tepe. The Pikpa team was determined not to allow escalation of racist and fascist attacks in town and the police transferred the people to Pikpa. As the judge announced her decision late in the afternoon, there was a pause in the court in Mytilini, the capital of the Greek island of Lesbos, as translators did their work. Then the packed public gallery erupted. Some 50 cheering and clapping spectators invaded the stuffy court room, pushing aside startled policemen and court officials. Two humanitarian volunteers from Denmark, Salam Aldeen and Mohammad Abbassi and three from Spain, Enrique Rodríguez, Manuel Blanco and Julio Latorre, arrested on 14 January 2016, had been finally acquitted of the charge of attempting to traffic asylum seekers. The volunteers came from the Spanish PROEM-AID and the Danish Team Humanity,two of the many humanitarian NGOs working to help people arrive safely in Lesbos. The three Spanish volunteers are professional firefighters. 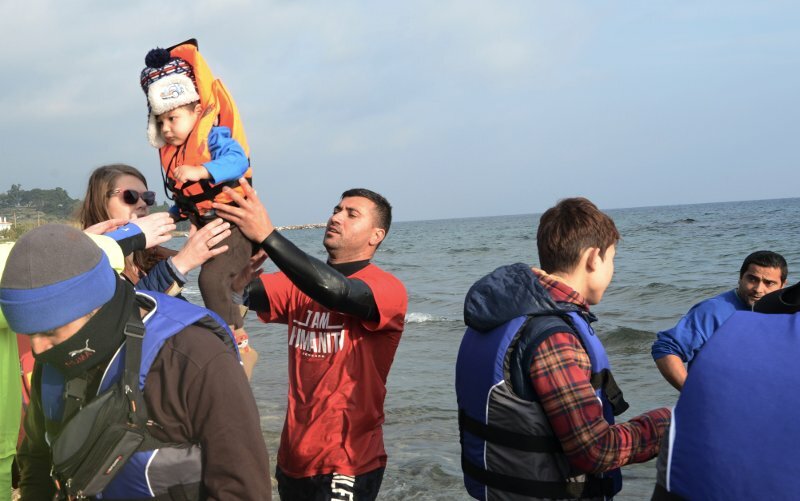 Via W2EU Infomobile – On 24 of April 2018 one year had passed since 22 people among them two children lost their lives in the boat accident north of Lesvos. Rescue teams managed many hours later to rescue two women alive, one of them pregnant in the 8th month. 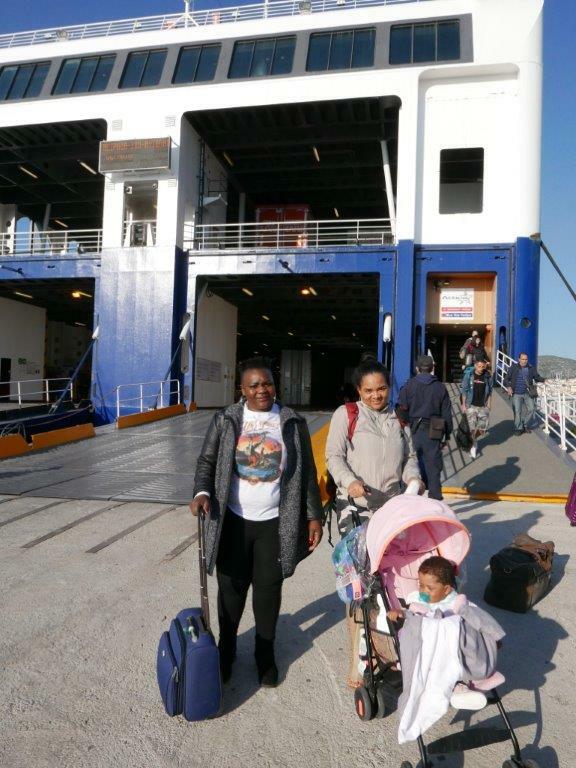 Sylvie and Joelle and the little girl Victoria, born in Mitilini just one month later, came again to Lesvos to remember this year. Together with the rescue teams of Refugee Rescue / Mo chara and with the activists from Watch the Med Alarm Phone and Welcome to Europe they returned to the place the rescued women and also the dead bodies had been brought one year ago. Also the spotting teams who still care every night at the beaches to spot boats on the way from the Turkish to the Greek side, Lighthouse relief and The Hope Project, joined the invitation to the three women. Moria 35 Trial Ends in Conviction of 32 – But After 9 Months of Unjust Detention, the 35 will Finally be Free! Via ECRE – Op-ed by Carlos Orjuela and Lorraine Leete of Legal Centre Lesbos. 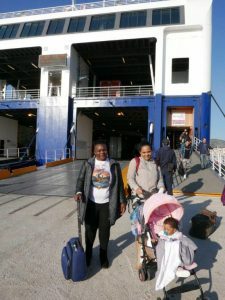 “On the 20 April, we are scheduled to attend trial in Chios after waiting nine months, trapped on Lesvos, while 30 of our brothers unjustly have waited in prison for this same time period. Our humanity has been denied since we stepped foot in Europe, the supposed cradle of democracy and human rights. . . We are treated like criminals, simply for crossing a border that Europeans can freely cross.” An excerpt from the Statement by 5 of the Moria 35 Defendants. 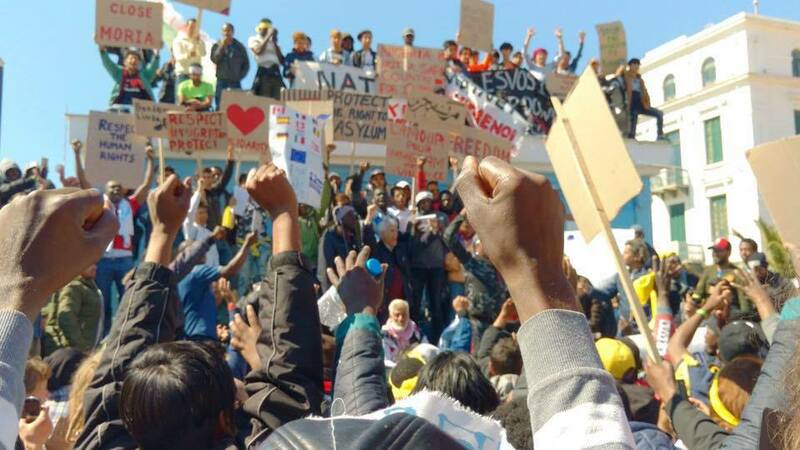 Today begins the trial of the Moria 35, which will determine the fate of 35 individuals arrested following a protest outside the European Asylum Support Office (EASO) in Moria Refugee Camp on 18 July 2017. The stakes are high in this inherently political trial. The 35 face criminal charges for which they may receive 10 years in prison and probable deportation if found guilty. A relative of victims in Agathonisi shipwreck speaks at a demonstration in Athens and asks central questions. Social Center Kapılar in Izmir needs financial support! Kapılar is a unique community hub in the heart of the Basmane district in Izmir, Turkey. It is a bustling social centre where people meet and organise to make friends and share skills and knowledge. As an independent organisation, they rely solely on private donations from friends and those who support our work, both in Turkey and abroad. Now, they ask for support to help continue their vital work and projects in 2018! Welcome2Europe updated their information on Turkey and added information for migrants who have been intercepted back to Turkey at sea or land and for those who have been readmitted/deported to Turkey from Greece. For now the information are available in English. Arabic, Farsi and French will follow soon.